Text in italics from Grand Canyon Railway. Did you know that Grand Canyon Railway carried 222,277 passengers into Grand Canyon National Park in 2005? That translates to nearly 7 percent of total South Rim visitation. Looking to the future, Grand Canyon Railway has the potential to more than triple its passenger counts and plays an integral role in Grand Canyon National Park's conservation and transportation solution. Since we would be driving to the Grand Canyon from Southern California, we decided on the package which would allow us to arrive and stay the first night in Williams, AZ. This allowed us to take the second day to leisurely ride the train 65 miles to the National Park. We would enjoy walking to the rim of the canyon and dinner at the Lodge that evening, and stay the night in the Grand Canyon National Park. The third day we would take a Rim Tour in the morning, and the train back to Williams. 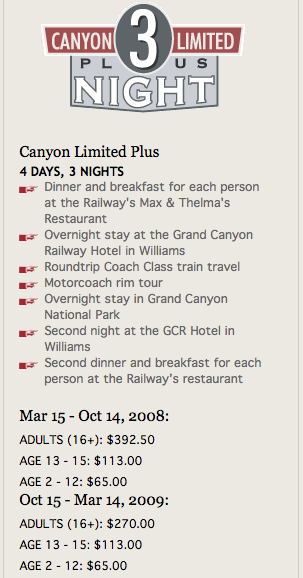 We would have buffet dinner at Max and Thelma's, and stay the night in the Grand Canyon Railway Hotel. The Package highlights are listed in their ad to the right. We also decided to start this adventure on October 15 to realize a $122.50 savings per person. As I look at the weather forecast, I see that the predicted high is 74 and the low is 31 degrees...I can spend the savings on a coat! We found that some prices were better on certain packages when booked through AAA of Southern California. In fact, by booking within a week after attending a Grand Canyon Railways presentation at AAA in Fullerton, CA, we received a complimentary book: Rails to the Rim - Milepost Guide to the Grand Canyon Railway. Highlights of the book are: • Points of Interest, • Geology, • Grand Canyon Region, • Railroad History, • Photo Locations, • Wildlife, • Plants and Trees. We chose to spend more time in Arizona than just the Grand Canyon Railway. We left on a Sunday and spent the first night in Palm Desert (near Palm Springs on the map below). The second day we drove to Phoenix Via I-10, and spent 2 nights. The third day we drove north of Phoenix to Sedona, AZ, for one night. The 4th day we drove to Williams, AZ, and started our 4-day, 3-night adventure at the Grand Canyon Railway. We drove back to So. Cal. following the red route on the map below, which was I-40 to Barstow, then I-15 to So. Cal. Not mentioned on their website, but taking the Amtrak Southwest Chief is a good option for an all-train vacation. You can board the Southwest Chief in Los Angeles (or Fullerton, Riverside, San Bernardino, Victorville, Barstow, California; or Kingman, Arizona) and arrive at Williams Junction with no driving involved. See below for the Amtrak Route Atlas of this route. 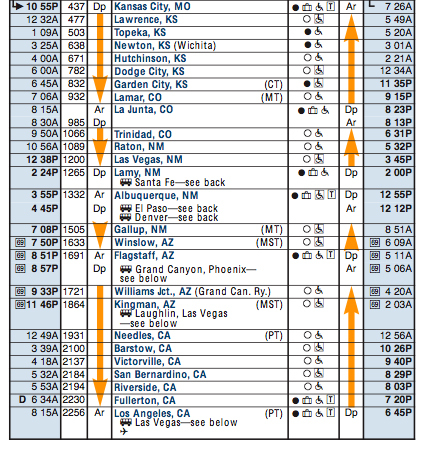 The Southwest Chief leaves Los Angeles at 6:45 pm and arrives at Williams Junction, AZ, at 4:20 a.m. You can return as you see below. If you get a bedroom in the Chief, it will include your meal in the diner as well as the bedroom in which to travel and rest. 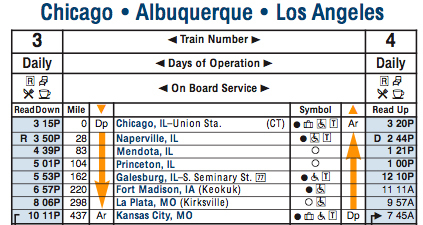 Since the Southwest Chief originates in Chicago, check Amtrak Schedule (right) to see when the westbound Chief departs. Day 1: Depart Los Angeles eastbound on Amtrak's Southwest Chief. Your Rails to the Rim adventure begins when you board Amtrak's Southwest Chief eastbound at approximately 6:45pm. 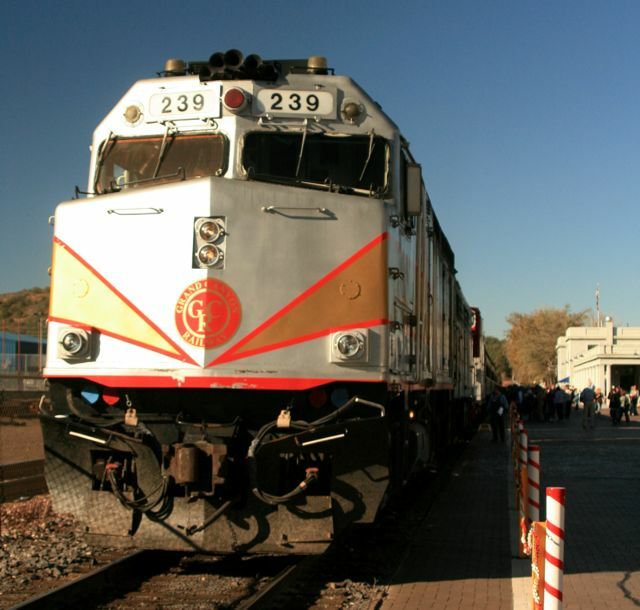 Relax as the sunsets and you ride the rails to Williams Junction, Arizona. Day 2: Early morning arrival at Williams Junction Arizona. The Southwest Chief pulls into Williams Junction at 5:20am and you are transferred to the Grand Canyon Railway Hotel. Check into the hotel for a few more hours of sleep. Freshen up and head to Max & Thelma's Restaurant for a hearty breakfast buffet. Board the historic Grand Canyon Railway for a 10:00am departure north bound to the South Rim of the Grand Canyon. Arrive at the Grand Canyon Village and check into the Maswick Lodge. Next you will join up with the Freedom Tour of the Grand Canyon. More than just a great road trip, it's a great train trip. We recommend taking the Canyon Limited Plus or Railway Getaway Plus package coming from Southern California. The schedules of these packages will fit perfectly into your itineraries for a great long weekend or mid-week getaway. Simply take I-40 East until you get to Williams. The drive is a little over 6 hours from Los Angeles. Williams, Ariz. was the last town in America on Historic Route 66 to be bypassed by the freeway. Interstate 40 replaced the last surviving segment on Oct. 13, 1984. Founded in 1874, the town's current population is approximately 2,900. The downtown business district of Williams is listed on the National Register of Historic Places and many of the downtown buildings were constructed around 1900. This Historic Downtown District covers six square blocks, along with the Grand Canyon Railway Depot. Visitors can take a self-guided historic walking tour of this Historic District and famed Route 66 with the help of a brochure available at the visitor center. Notice in the Lobby of the Grand Canyon Railway Hotel in Williams. There are many classes of Service to choose from on the GCR. We chose First Class. Two considerations were air-conditioning, since it can still be hot in Arizona in October, and reclining seats and extra-large viewing windows. Style and space - the opulence of oversized, reclining seats along with extra-large viewing windows, make for a true First Class experience. As do the fresh fruit, pastries, coffee and juice provided during the morning journey and champagne on the way back. Complimentary soft drinks are served throughout in these air-conditioned cars. 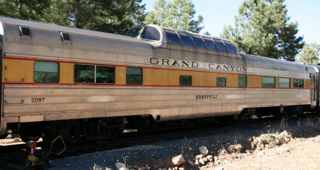 Grand Canyon Railway has four first-class cars in its fleet. This unique dome coach was built by Budd Manufacturing Company in 1954 for the Chicago, Burlington and Quincy and Northern Pacific railways. It first served that railroad as No. 554. Amtrak purchased the car in 1971 and assigned it number 9481. Grand Canyon Railway purchased the car in 1996. It first went into service for Grand Canyon Railway in March 1997. This car features two classes of service: First Class and Deluxe Observation Class. Pastries, coffee, tea and fresh juice are available during the northbound journey. Champagne and appetizers on the southbound journey are included in the fare. Service from a fully stocked bar is also provided, and strolling musicians perform en route. Pepsi is complimentary. The Deluxe Observation area seats 24. It features panoramic views from a glass dome observation area. The section is configured to seat four across with a center aisle. Handicap service is not available and children under 11 are not allowed in this section. The First Class section seats 40 in comfortable recliner chairs. The section seats four across with a center aisle. Oversized restrooms with a sitting area are provided for both men and women. The Coconino Car is air-conditioned in the summer months and comfortably heated during the winter season. This car is staffed by a coach attendant, and it can be reserved for groups and special events. Built for the Empire Builder, the premier "name train" between Chicago and Seattle, a train jointly operated by the Great Northern Railway, the Burlington and the Spokane, Portland & Seattle. The three railroads shared ownership of the car. The car was originally put into service for the GNRy, May 29, 1955 with the number 1326. 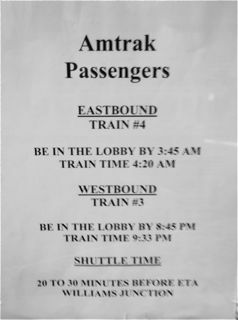 On May 1, 1971 Amtrak took over the nation's remaining passenger routes. Car No. 1326 and her sister joined the new system. Owned by Amtrak until 1984. From 1984-1985 the car was leased to the Alaska Railroad, after that the car was stored for a number of years and finally sold to a private owner. In 1998, under the new ownership of the Great Northern Dome Co., the car underwent a full rebuild after years of neglect. The rebuild included a complete truck rebuild and installation of two Safety-Stone heating and air conditioning systems. In May of 2000, Grand Canyon Railway leased No. 1326 from the Great Northern Dome Company to replace another dome car in the GCRy consist. No. 1326 was repainted and named the Kokopelli. This car features two classes of service: First Class and Deluxe Observation Class. The Deluxe Observation area seats 24. It features panoramic views from a glass dome observation area. The section is configured to seat four across with a center aisle. Handicap service is not available and children under 11 are not allowed in this section. The First Class section seats 40 in comfortable recliner chairs. The section is configured to seat four across with a center aisle. Oversized restrooms with sitting areas are available for both men and women. The Kokopelli Car is air-conditioned in the summer months and comfortably heated during the winter season. This car is staffed by a coach attendant and it can be reserved for groups and special events. This car was built in 1948 as a 16-section sleeper for the Denver Rio Grande Western. At the DRGW it was called Silver Aspen and given number 1120. It was eventually converted to a 48-seat coach and acquired by the Chicago Northwestern and renamed the Iowa River with number 422. The CNW put the Iowa River into its business-car fleet where it served as a classroom. The car changed hands a couple of times before being acquired by Railroading Heritage of Midwest America, a foundation dedicated to preserving historical railroad equipment. Grand Canyon Railway purchased the car in June of 1999 from Railroading Heritage of Midwest America. Grand Canyon Railway rebuilt the car and put it into service in April 2000. The car was renamed the Colorado River and given the number 2098 at that time. The Colorado River features First Class service. Pastries, coffee, tea and fresh juice are provided during the northbound journey. Champagne or sparkling cider and appetizers on the southbound journey are included in the fare. Service from a fully stocked cash bar is also provided. Strolling musicians perform during the journey to and from the canyon. Pepsi is complimentary. This First Class car seats 50 in comfortable reclining chairs that are configured for seating four across with a center aisle. This car is staffed by a coach attendant. Restrooms are available for men and women. The Colorado River is air-conditioned in the summer months and comfortably heated during the winter season. This car can be reserved for groups and special events. These classic cars were part of a large 32-car order sent to the Budd Manufacturing Company in 1951 (Job 9621-110). The order of 60-seat coaches with lounges was part of an attempt by the Pennsylvania Railroad to upgrade service on the busy New York – Washington corridor. The Boston Washington Senator and the Morning and Afternoon Congressional trains received most of the cars, but several went to other trains. The cars ran with the Pennsylvania Railroad, beginning in 1952. Then later moved to Penn Central Railroad. In 1976, Amtrak purchased all but two of the original 32 cars. 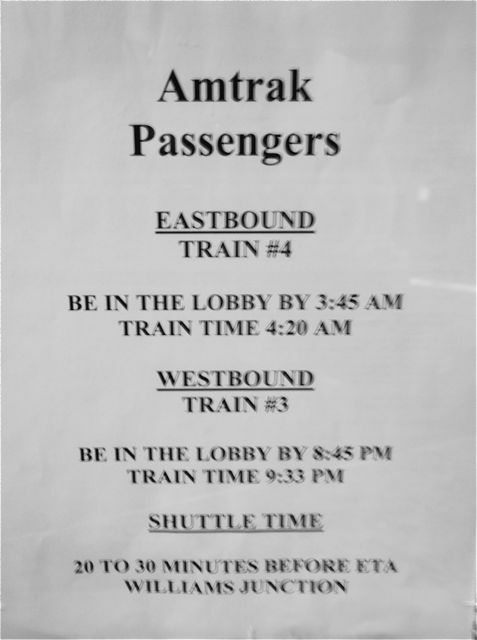 Many of the cars were still in service for Amtrak as late as 2001. Two of the original 32, No. 1568 and No. 1581, were scrapped in 1968. Grand Canyon Railway acquired the cars in 2003. It completed a full restoration and in 2004, the cars went into service as First Class coaches. Today, passengers can enjoy the original color combinations and etched glass and mirrors featuring historic early American themes. With all our reservations made, we arrived on October 16, 2008, to begin our Grand Canyon Railway Adventure: Rails to the Rim. September 11, 2008WILLIAMS, Ariz. - Fires have been permanently dropped from Grand Canyon Railway's steam locomotives, owner Xanterra Parks & Resorts has announced. The company said it is permanently canceling the steam program owing to its impact on the environment, and has laid off 20 employees as a result. An industry source with specific knowledge of the situation, however, paints the action as a business decision driven by fewer riders and costlier fuel. 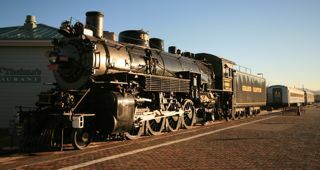 Grand Canyon's steam locomotives will be placed on static display, and Xanterra spokesperson Judi Lages said the company has no plans to sell them. GCR operates one daily steam trip between Memorial Day and Labor Day. The trains are powered by one of the railroad's three steam locomotives: a 2-8-0 and two 2-8-2s. Xanterra provided TRAINS News Wire with a letter it wrote to a steam fan concerned about the cancellation that outlines some of the operational factors of running steam and diesel locomotives. 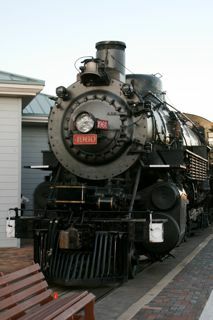 In the letter, Xanterra claims a steam locomotive uses 1,450 gallons of diesel fuel to run a round trip from Williams to the rim of the canyon, while a diesel locomotive uses only 550. The letter also cites the water savings, plus the savings in journal oil, steam oil, and bearing oil, plus the 1,200 gallons of water used daily by the steam engine. "[W]hile we certainly understand and appreciate your feelings regarding our decision to suspend operations of the steam engines, we hope the above points will help you understand our decision," Lages wrote in the letter. Meanwhile, diesel-hauled trains will continue to make the 65-mile run between Williams and the Grand Canyon's South Rim. The company operates vintage Montreal Locomotive Works units, four FPA4s and two FPBs built for Canadian National and later used by VIA Rail Canada, as well as three former Amtrak F40PHs built by EMD. Next: The Grand Canyon Railway Hotel and Ride to the Canyon.